Who will come up now? Ruanel: I am again with you here. I Am Ruanel. Interlocutor: How are you Master? 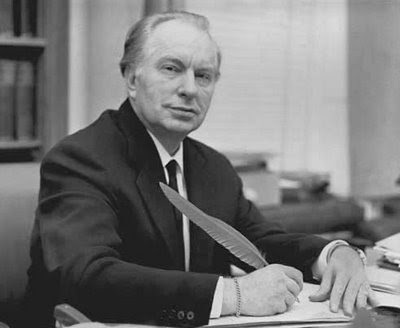 I suppose that you must be quite disappointed with those scientologists who are in charge of the organizations of Dianetics and Scientology that you founded. I say this because in spite that I have informed them repeatedly about our telepathic communications we have with you, they have refused systematically to be aware of that. Ruanel: In the spiritual plane with the help of Johnakan, I have learned many more things that are not written in the documents I left when I was incarnated, and it is a pity that we cannot transmit them because not only have they stayed stuck in time, but rather they have closed the doors. They don’t want to know anything about new paradigms and then they obstruct the mission. When Siddhartha Gautama, the founder of Buddhism, created rules, somehow he had to do something that maybe was not good; he had to indoctrinate, being that in Light, all dogma, all doctrine is bad, but Siddhartha had so few followers that he had to create certain rules so that his teachings were not dispersed and they were not diluted. In spite of the comparison with Buddhism, I had to do the same thing with Dianetics creating rules, rules of behavior so that they were not dispersed. Today, at the distance, I confirm that certain rules are not right. Buddhism corrected that issue 500 years later. How many generations had to pass before that happens? Interlocutor: I agree and I understand it perfectly, but if I could get rid of those rigid rules, I wonder if there is somebody capable to avoid them also. Ruanel: Most of the human beings, like our brother Jiddu Krishnamurti said, -and I mention him because he is a true leader- they are conditioned. Then, if they have been taught in that way, maybe by myself when I was incarnated, How will they be released of those rules? Interlocutor: I agree perfectly with you, Master, but I insist: you, inside of those rules, you taught that Thetans communicate telepathically. Then, why don't they try to communicate with you, if you taught that and you even left it written? Ruanel: Unfortunately they are very skeptical. But there is one thing more, the current great leaders of the Church of Scientology, “alleged representatives of the Master Jesus,” who is known by everybody and I say “alleged” because for me the only true representative incarnated is the Master Johnakan. These leaders are arrogant and most of them would not find convenient if the Master Jesus embodied again because they would lose their prominence. In the same way, if the directives that today control Scientology came to the sessions and if they verify the truthfulness of these communications you have with me, they would lose their prominence as representatives of the organization. Interlocutor: This is clear, Master. Ruanel: They don’t care about the teaching, they are more interested in playing their roles, and the EGO they have is the biggest obstacle so that they come and communicate with me in spite of what I left written. Then, they prefer to ignore it. Interlocutor: I understood it perfectly, I’ll continue with another question that I wanted to ask you for a long time and it has to do with hypnotism, which is also related to extraterrestrials and abductions. Here we have had two hypnotists like Tony Kamo and another…. Ruanel: He is a fraud! Ruanel: He is not a hypnotist, but an animal charmer, nothing more. In the United States there were good hypnotists who performed hypnotic regressions to some people and their cases were well-known. I am an enemy of traditional hypnotism, but in the case I am speaking about, when a woman was hypnotized and even she was regressed to a past, it was even possible to modify her accent. I repeat that whenever a medium channels a spirit, even though the spirit is from another planet or another region, that medium will always speak in his own language, because is in his language that he is channeling the idea of the thetan or spirit... Is that clear? Ruanel: But in the case of this woman, she was regressed to a previous life, she had Irish accent, and it is logical, because she was taken to a previous life. In this case, hypnotism was useful. Interlocutor: I understand, but you are very drastic when you said "fraud" I Myself have experimented as a hypnotist and I know that hypnotism works. Ruanel: Correct, but you have asked me about theatrical people and I repeat that everything is a fraud and the people who had allegedly been hypnotized have been part of the fraud. Interlocutor: But some hypnotists have performed acts in stadiums, I find it difficult to believe that thousands have been part of the deception. Ruanel: Do not confuse suggestion with hypnotism. Those people were induced, not hypnotized. Interlocutor: Which case would be, for example, a suggestion? Ruanel: A suggestion would be, for example, when somebody receives an onion and he or she is influenced to believe that it is an apple or vice versa. Ruanel: In other cases, there are actors or actresses who take part on the deceit, and they play their roles very convincingly, for example, when they obey the suggestion of the hypnotist and they wake up, they fall in love or they take off their clothes because it is very hot. Ruanel: He is also a fraud just like Tony Kamo. Interlocutor: If hypnotism exists, Why do they deceive people? Ruanel: The true hypnotism, and I emphasize the word true, goes beyond an ordinary theatrical exhibition. The true hypnotism can be used, in any event, in healing sessions, in regression to past lives, but not to make a TV show. When you see that the hypnotist orders a person something like: “now you will fall asleep deeply and you will wake up when I snap my fingers and you will fall in love with the driver”, or something similar that is not real and it has been arranged. Interlocutor: Definitely then, it is only an ordinary deceit. Interlocutor: I can hardly believe that something so coarse is used to deceive the audience. Ruanel: The coarsest thing is usually what attracts more. Interlocutor: But Couldn’t Paul McKenna prepare those people hypnotically and perform a serious show? Ruanel: They are theatrical or directly tent shows and it is easier to pay somebody so that he acts as if he were hypnotized. Hypnotism takes a long time, it is not something magic and many people cannot be hypnotized. It is not something easy. It is easier to pay an actor so that he plays the role of a person in hypnotic trance. We should thank that real hypnotism exists, because many people can be alleviated of their ailments and even travel to past lives. Interlocutor: But what about the engrams that hypnotism implants? where are they? Ruanel: In these cases, hypnotism doesn’t even create engrams. On the contrary, it eliminates engrams. Let’s not be so strict. I learned now, in the plane in which I am and thanks to Johnakan, I learned to tolerate things I didn’t tolerate when I was incarnated. Hypnotism is not always the enemy. Interlocutor: But Master, even you performed hypnotism? Ruanel: I practiced hypnotism, but not serious hypnotism. Interlocutor: Needless to say that by means of hypnotism murderers have been programmed. Ruanel: Yes, in some cases yes. Interlocutor: Even you denounced these practices on behalf of some agencies of intelligence of the United States. Ruanel: Now, at the present time, from the plane I am, I know positively that when one programs hypnotically a murderer and if this person has a so charged reactive mind and he/she is a very cruel spirit, he/she is already predisposed to murder. A person who is in Light, no matter how much one wants to program him as a murderer, he will always resist that kind of orders and he will never be willing to kill anybody, no matter if there is a hypnotic order on this aspect. I want to make clear this, because otherwise all the people will be afraid of being hypnotized. A person who is in Light will continue in Light, no matter how much they try to program him. And he will resist the order saying, No and no. Interlocutor: According to your explanation, there is no place to long distance hypnosis or sexual commands at distance. Ruanel: No that is nonsense. Interlocutor: Here in Argentina there are some parapsychologists that say they can do it. Ruanel: They are fabrications, as you say. These parapsychologists are the ones who destroy the seriousness of these things. Interlocutor: Do they believe in these pseudo powers or they know that it is a fraud? Ruanel: Some of them have “few lights” and they believe in these powers. You can label them yourself. Interlocutor: Well, I would directly call them stupids, or even cretins. Ruanel: Those terms would be correct to brand them, others don’t fit. Interlocutor: How do extraterrestrials do to abduct people? Do they hypnotize them and transport them by normal means as if they were "Guinea pigs" or they directly dematerialize them and materialize them again in the space ship? Ruanel: in very few cases they are hypnotized. When they do it, they take them as you say, but in most of the cases they use teleporting machines. Interlocutor: Are you telling me simply that they dematerialize them and materialize them in the ship again? Interlocutor: And can they do it easily? Ruanel: Of course! If in the planet Earth, with an incipient technology, you are achieving it; How won't aliens do it if they have perhaps an advance in that technique of 200 or 300 years? Interlocutor: Well, this is clear. Moving on to another topic, how does the placebo effect work? I mean to a person who has a headache and they give him a sugar pill saying that it is an aspirin and the pain disappears. Ruanel: That is suggestion. By suggestion a human being can even get sick, and by suggestion he can also be cured. Interlocutor: Are we speaking about simple things? Ruanel: Correct, we are speaking of headaches, nervous states that have mental origin and similar things. Let’s suppose that a person is nervous and a friend tells him: "Take this pill, it’s an anxiolytic", the person takes it, although in fact it is an aspirin or maybe not even this, and the person automatically is alleviated. From our plan we have seen numerous times that a nervous person takes an anxiolytic and 15 seconds later that person feels relieved, when the pill not even began to make effect, since in the physical plane more time is needed to produce it. Interlocutor: I remember I saw in many spy movies where somebody pours some drops or a sleeping pill in the coffee and after taking it the person is sleeping deeply in few minutes. Ruanel: The example is valid and you know that that is impossible. It’s important to make clear all these things in order to demystify them. A while ago you mentioned Tusam who without being a great hypnotist, I attribute many things in his favor, because he is a being of Light of the plane 4, already disincarnated that demystified many myths. Interlocutor: I understand. I watched many of his performances on TV. To conclude, I have a question that doesn't have anything with what we have spoken up to now, but I always had it scheduled. We know that each spiritual plane has sublevels. How do you distinguish them? Ruanel: One cannot look to the higher planes, but one can do it with the inferior planes. But the higher sublevels can be seen because the sublevels are not divisions in fact. They are like classrooms in a Faculty- using a terrestrial simile, only as a basic example to be understood-. It would be like going to a meeting in the sublevel 9 if I am in the sublevel 5, and I can do it as an unregistered student and even participate. The sublevels are for actions of help that one does in the physical plane. It is not about definitive nor marked differences. Ruanel: I want to make a last reflection through an allegory, because I read in your mind that you wanted to know if the mission you have will have fruits. I’ll give the following example: you have a big tree and a non small axe, but a medium size axe, and you wonder if you will have enough life to knock down the tree and build a cottage. Will you achieve it, won't you achieve it? Your mission is to lumber. The mission is to teach, to give Light, to offer Service and the success will come as a consequence. Interlocutor: Is it something like the result doesn't concern us? Ruanel: In fact, the result does matter because each mission goes after a result, but the goal is the mission and not the result itself. Remember in this sense what the great Master Johnakan said: "The Goal is the Quest." Interlocutor: The idea is perfectly clear: It is necessary not to worry about achieving the goal, but about walking, because walking is how we will arrive to that goal. Ruanel: You have understood the concept. A hug and I leave all my Light with you. Interlocutor: See you later, Master, and thank you. This entry was posted at Thursday, December 10, 2009 and is filed under Messages of Light . You can follow any responses to this entry through the .